Clip, clop, clip, clop. The horse’s hooves beat a rhythm on the road, swaying the cart from side to side as we bounced along the ruts of the muddy road. 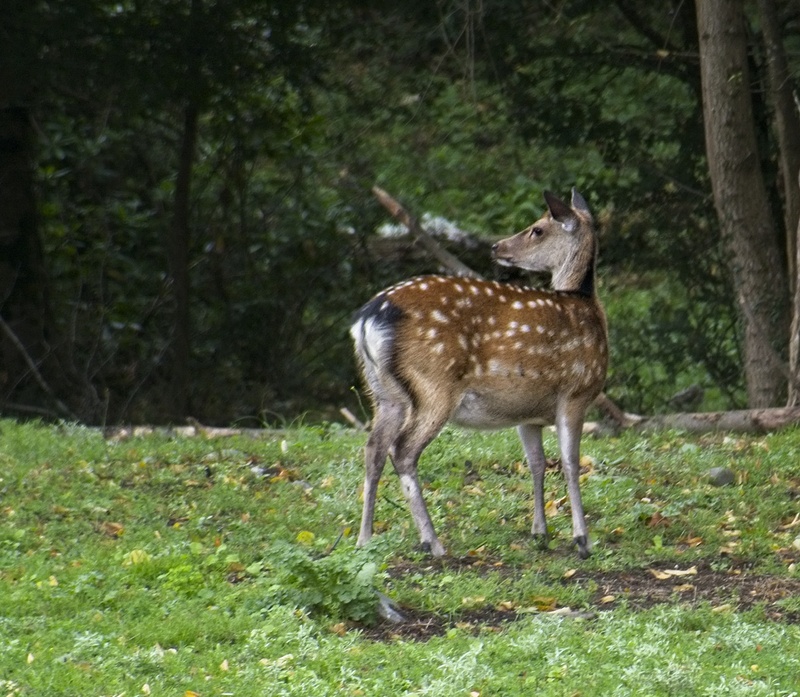 On one side of the road, a brook meandered along, on the other, a red deer. And this was just part of the day’s jaunting around. 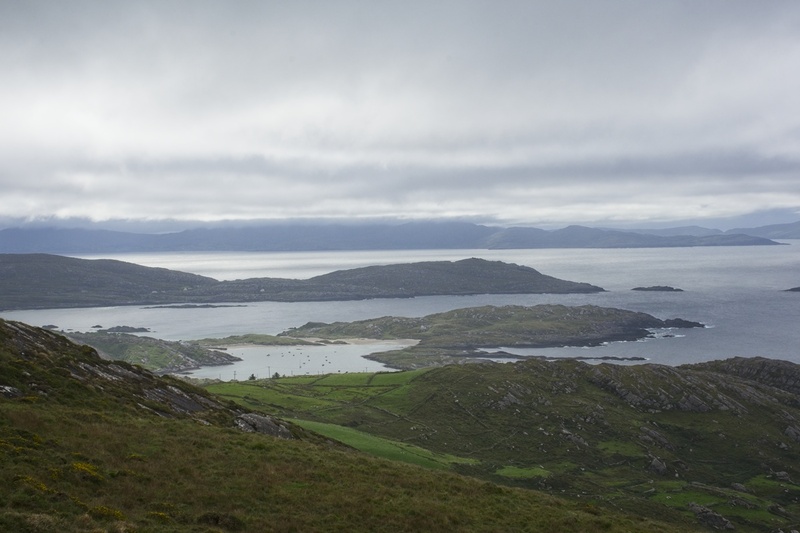 The day’s main event was a better-known excursion – circumnavigating the Ring of Kerry. That item falls into everybody’s things to do Ireland list. (Even the locals.) Located on the southwest coast of Ireland, it’s full of rocky headlands, scenic overlooks, mountains, little towns; everything you could ask for in a vacation getaway. And the kickoff point? 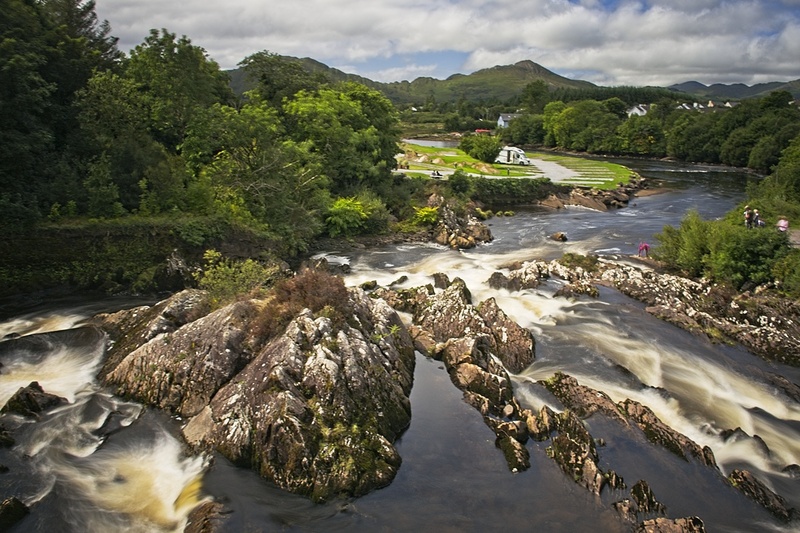 A town with a good Irish name – Killarney. This was not my first trip to Ireland. Way back in 1980, when the world seemed much younger (or at least I did), I spent a couple months doing the youth hostel routine around western Europe. 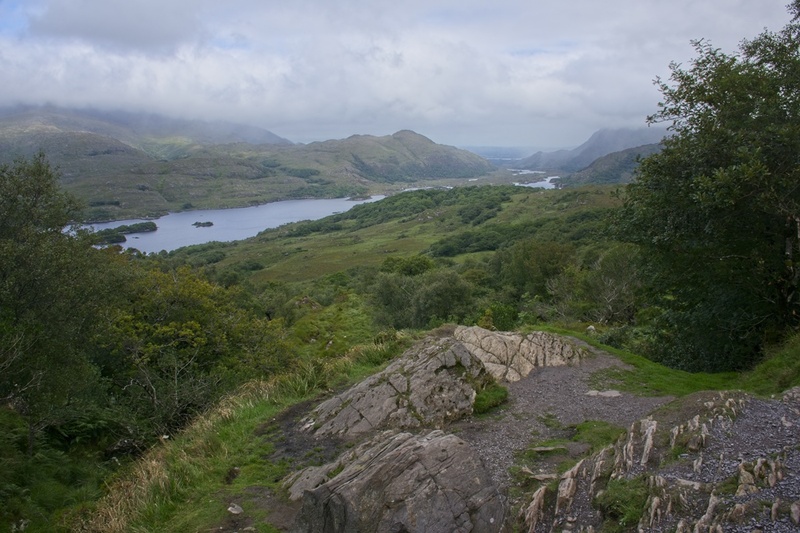 Ireland was one of the early stops on that trip, and Killarney and the Ring of Kerry were a special part of that trip’s memories. Long term friends, long term memories, I was looking forward to the return. Of course, this time around I was traveling on a tour bus, with a wife and a group of folks of a more “seasoned” age that we were just beginning to get to know. Perhaps some of them will become long term friends as well. There’s a trick to riding a tour bus on the Ring, one I didn’t know when we started. The upshot is, it’s better to be sitting on the right side of the bus, since that’s the side all the coastal views will be on. We, naturally, were on the left side. So despite my flowery words about the scenery, I didn’t take many pictures while en route. There’s only so many profile pictures of the guy sitting across the aisle with a bit of scenery in the background that I need in my collection. No, the guy across the aisle wasn’t an old goat, royal or otherwise. 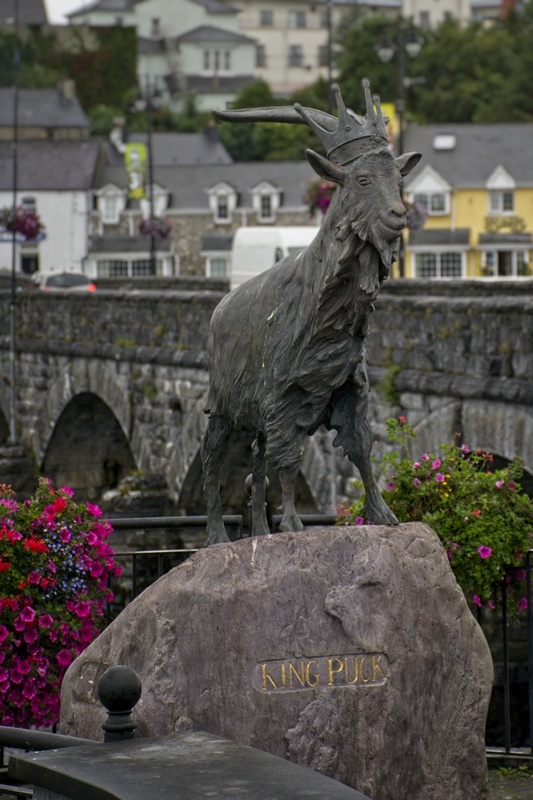 This statue represents the mascot of the oldest festival in Ireland, held in Killorglin, one of the first towns we passed. It’s not certain when it started (probably pre-1600’s) or why. One story suggests it celebrates a heroic billy goat that, when startled by Oliver Cromwell’s raiders ran into town all agitated and let the townsfolk know something was amiss. In any case, it’s an excuse for the country folk to gather, buy and sell goods, and party until 3 AM. (Special dispensation to keep the pubs open later.) At the beginning of the 3-day celebration, a wild male goat (a puck) is captured, kissed by a virginal young lass, crowned King Puck, and placed in a cage on a high scaffold where he surveys the fun for the duration. 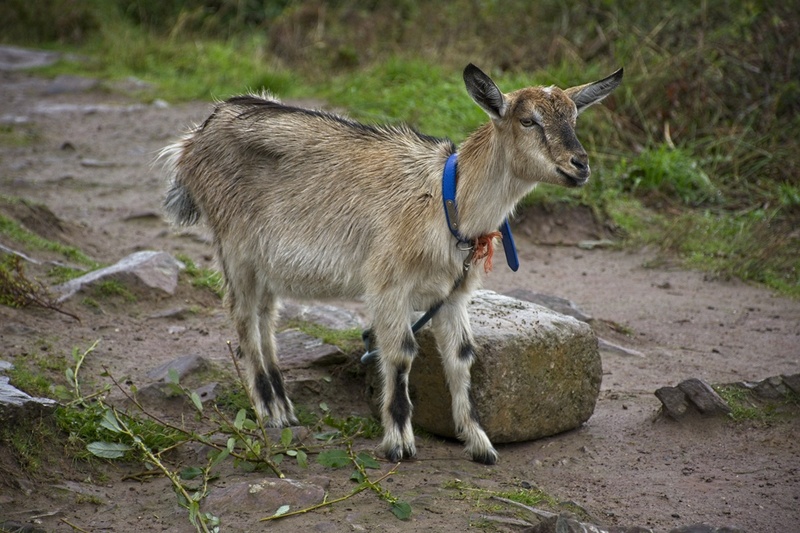 Afterward, the goat is returned to the wild. A not so wild goat at a roadside stop. I can give you one nice panorama from a viewpoint on the western tip. No profiles included, but perhaps a bit of courage, standing atop a rock wall, being buffeted by 20-30 mph winds. As always, click for a larger view of any picture. After stopping for lunch at an inn our guide swore had the best scones in the country (they were good, but mostly because they were fresh from the oven), we wandered a bit and came across this river. 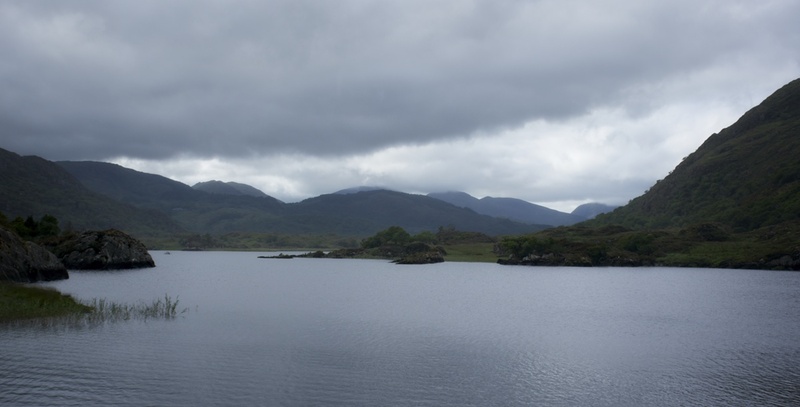 Getting closer to Killarney we entered into Killarney National Park and took in the view of the Upper Lake. And closer in still, I believe the lower end of Upper Lake. We must have been wicked on the trip. After arriving back in Killarney there was no rest; it was straight to the Jaunting Carts. These horse-drawn carriages have long been a traditional way of getting around in Ireland, well before those newfangled auto-mobiles. We used one of these to jaunt around the park near Killarney town. Along the shores of Lough Leanne lay luscious livid (say that real fast) green foliage, abutting Ross Castle. The castle was typical of fortifications for Irish chieftains, and was probably built in the late 15th century. And after clip-clopping along, taking in the views of the park, its lakes, fields, rivers, bogs, houses, and even castles we headed back to town. But even there serendipity had a hand. 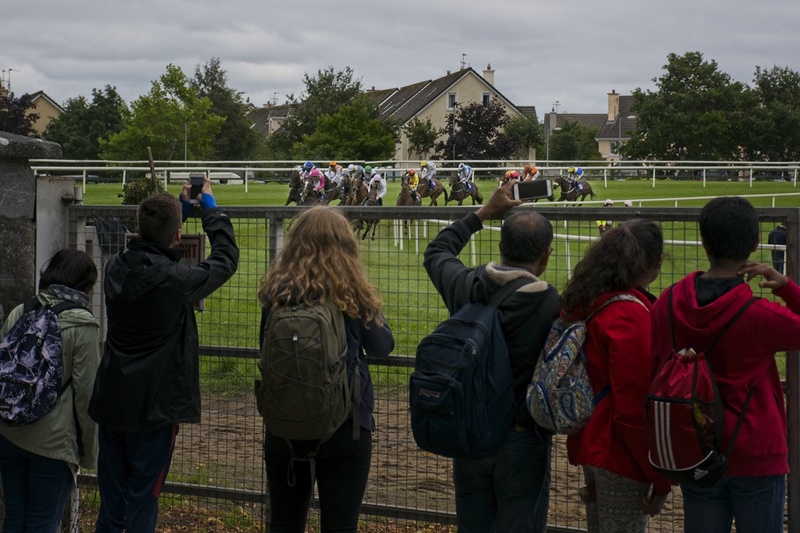 As we passed the race course, on one of the few days of the year they have horse races, just as we clip-clopped past an open view, a field of racehorses came storming into view. I was almost tempted to emulate Eliza Dolittle in My Fair Lady and rise up to shout out commentary as they thundered past. Finally, we made it back to the hotel, with a couple hours of free time to check out the town and grab dinner. And after dinner? More thundering. Irish step dancers, doing their song and dance thing. Similar to Dublin’s show, but with its own spin. After all that jaunting around, your head is probably spinning. Just the same, I hope you enjoyed the ride. Ireland is going to be my destination in my next life. Thank you for a wonderful report on this beautiful country, Dave! Well at my age (76) I feel safe to make such comments. Thanks, Mick. Have you been there? Not to that part of Ireland, Dave, no. Closest I’ve been is the south east – Wexford. Great tip for the ring! Jules makes fun of my inability to answer a “should we sit left or right” question without breaking out the smartphone to check routes and sun positions. Back to the US, or are you still on this side of the pond? Hey, who wants to swelter in the sun? 😉 The Ireland/Scotland trip was the last couple weeks of August. It’s been good for a few stories already, with plenty more in the queue. I’m not the fastest writer/photo editor – I doubt I could crank out pieces like this one while on the road. We’re still writing about stuff we did in May, so we can certainly relate to that! 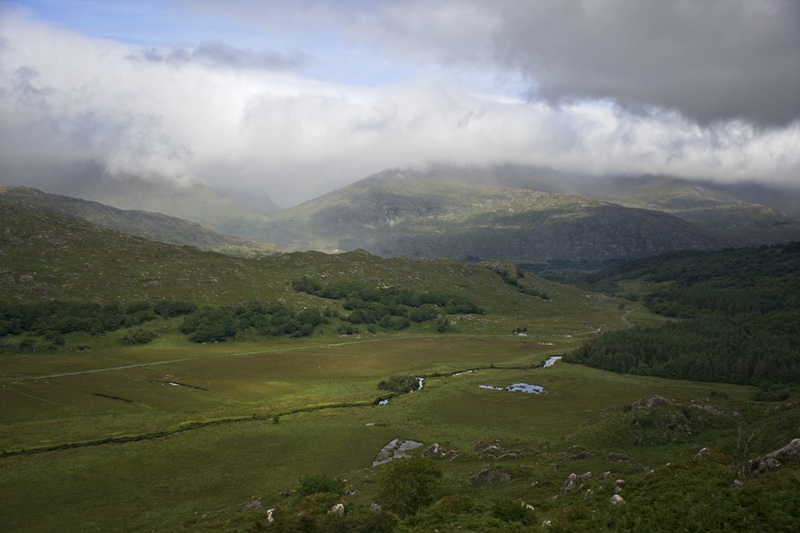 We have great memories from the Ring of Kerry…highly recommend the trip to the Skelligs. I’ve heard that hanging out with the Puffins at the Skelligs is one of the cooler things you can do in life. Maybe another trip. Neither of us has been to Ireland but your post definitely entices me to visit one day. Except for the one way Russian Roulette on wheels part. Yikes. 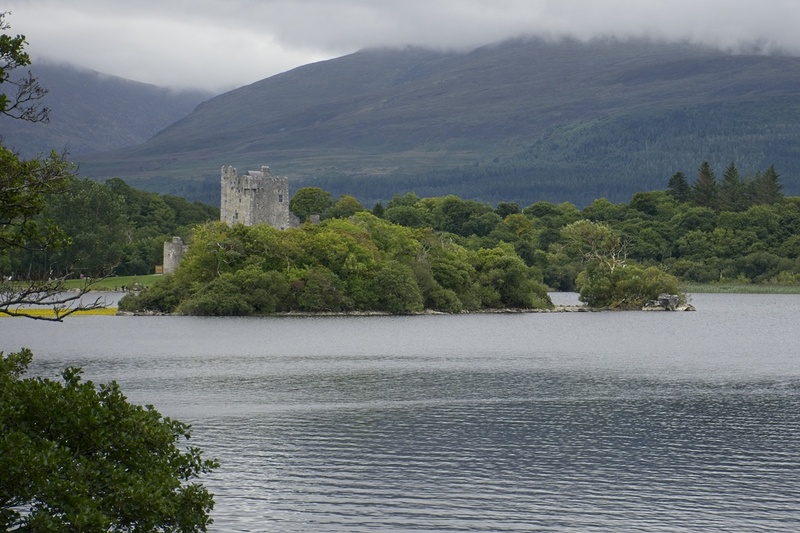 Really like your photo of Ross Castle, in particular. This is a wonderful album, and a great, jaunty commentary. I’ve only been in a horse-drawn wagon once, and it was just a plain buckboard, not one of these spiffing little carts. And that’s a great shot, with the church in the background. I wonder what went through the cart horse’s mind, when it saw the race – did it want to join in, or did it think, man, those kids are working way too hard, this is a better gig. Ireland looks just as green & lush as its reputation. The older horses probably are just thinking of getting back to the stall for some grub and a stiff drink. The younger ones are probably thinking of taking the tourists around corners fast enough to damn near tip the cart. As for the race horses, they may think they’ve got it easy, carrying only one rider. The wall wasn’t that high so it wasn’t that risky, just a little hard to hold the camera steady for all the shots. As for the desktop, you have to use your own fall shots first, then maybe something will say me, me! Trying to take beautiful pictures was part of the point, it’s my hobby. The fact I could helped make it an amazing trip. Great write-up and photos! I also visited Ireland and the Ring of Kerry back in the 80’s. I would love to go back one day. I especially like your lake shots! Thanks, Denise. Hopefully you can make it back, and photograph those lakes yourself. The ring of Kerry is definitely on my to-do list when I get back to Ireland. Your photos made it look even more beautiful than I imagined! And as much as I hate tour buses, I have heard that they are absolutely the way to go…..they say that for tourists driving cars on that route, its a very scary experience! It must have been a thrill to return to the places you visited in your backpacking days. I know that times have changed, but I hope it was as excellent as you remember. Thanks for a very enjoyable ride. Different. I’m a different person, it was a different time, I was with a different group. But still a good time. Such beautiful landscapes. Ireland (like Scotland) seems to be in a totally different world. It’s almost ethereal, but rugged at the same time, isn’t it?